Bahr believes that we the sum of our memories—even those that are not our own. In Traces, she uses photography and painting to consider the role of ancestral memory in identity. 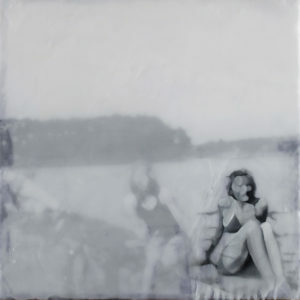 With layers of paper, oil paint and wax, she copies and preserve elements of family photographs (in particular those from post-WWII Germany) to create ambiguous narratives with figures, landscapes or objects—exploring how our fictionalization or imperfect remembering of the past plays a part in determining who we become, and influences what we leave behind. In 2016, Bahr graduated from OCAD University with a Bachelor of Fine Art degree as well as from the University of Toronto with a Master’s degree in Education.